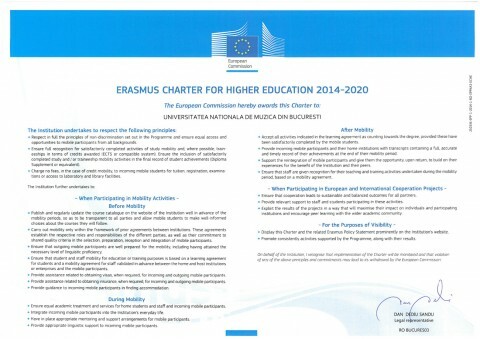 In December 2013, National University of Music Bucharest has been awarded this document. An important chapter of the Erasmus application is represented by the European Policy Statement (EPS) – UNMB’s strategy of internationalization. The signing process of the inter institutional agreements (IIA) under the ERASMUS + program is ongoing. Application Form which can be issued by the Erasmus office from the home university. Deadlines: for the first semester – 1st of May; for the second semester – 1st of November. Accommodation and other facilities: UNMB offers – by the principle “first arrived, first honored” – a limited number of rooms for the Erasmus students. Students who would like to make an arrangement for a private accommodation may be counseled by the Erasmus office from the university, as well. Student Mobility Placement (SMP): represents an activity which has been introduced in the LLP Erasmus program since 2007. National University of Music has already gained years of experience in organizing this kind of activity for its students and keeps developing it inside the ERASMUS + 2014 – 2020. Outgoing: teachers who would like to take an Erasmus teaching mobility have this opportunity in the limit of the available funds. Yearly, UNMB has an available amount of funds for three or four stages of teaching mobility. Application procedures: teachers who would like to take an Erasmus teaching mobility must have a complete file/folder, with the following documents: CV Europass in an international language, the Teaching Plan Form, a written application/request, mentioning three options from the list of the partner institutions. Selection criteria: teacher’s application/request and motivation, the agreement and the invitation from the partner universities. The Office of European Programs sends a list of the applicant teachers to the requested institutions. Teaching mobility will be organized taking into consideration the positive answers and the available funds. Necessary documents for the home institution: Letter of Confirmation issued and signed by the host university, mentioning the number of classes and the exact period of the teaching mobility. Incoming: teachers who would like to take an Erasmus teaching mobility at the National University of Music Bucharest must follow the same procedure – as mentioned above – in the Erasmus offices from their home universities. Application deadlines: end of April (for the 1st semester) and end of November (for the 2nd semester). The aim of this kind of mobility is to enrich the methods, tools and technics used by the administrative departments from UNMB and to share and exchange examples of good practices between the European partner institutions. KEY ACTION 2– Strategic partnerships for innovation and the exchange of good practices with Program and Partner (non – EU) Countries, aimed to develop initiatives addressing one or more fields of education training and youth and promote innovation, exchange of experience and know-how between different types of organizations involved in education, training and youth or in other relevant fields.